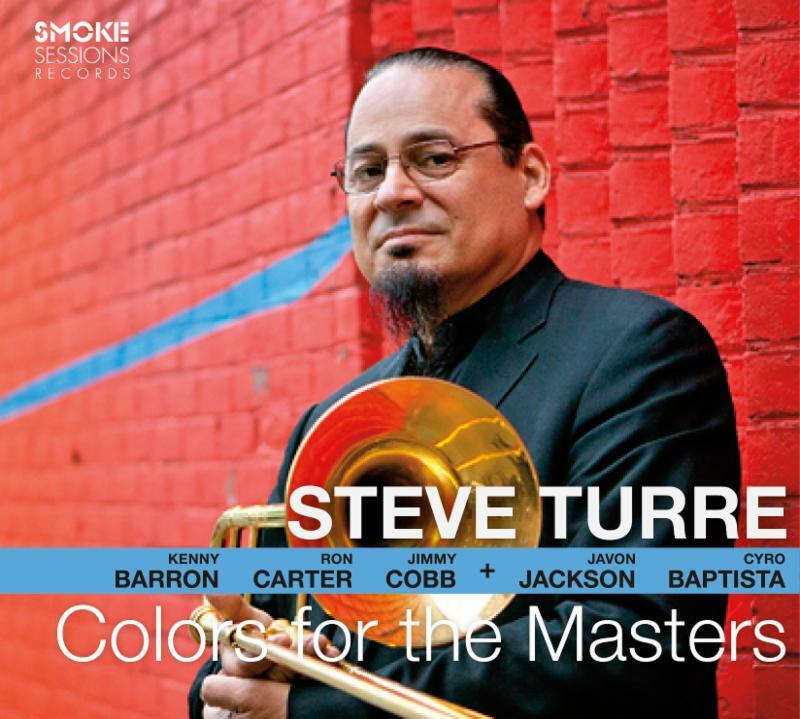 Trombonist and composer Steve Turre shows off his full spectrum of sounds on his latest album, Colors for the Masters. The album's ten songs, evenly split between jazz standards and original tunes that carry the torch for the tradition, offer a dazzling array of hues played in tribute to and alongside some of the elders that have inspired Turre. The leader's own trombone virtuosity is only one color in a palette that also includes a variety of mutes and his wholly original conch shell artistry. Colors for the Masters, due out August 26 on Smoke Sessions Records, teams Turre with a rhythm section of legendary elders, each of whom shaped the trombonist's distinctive voice: pianist Kenny Barron, bassist Ron Carter and drummer Jimmy Cobb. On four tunes the band is joined by saxophonist Javon Jackson, like Turre an alumni of Art Blakey's Jazz Messengers; and for the album's final tune, a stirring rendition of Jobim's "Corcovado" on which Turre shows off his innovative shell playing, virtuoso percussionist Cyro Baptista also joins in. Together, they pay electrifying homage to other, departed luminaries like John Coltrane, J.J. Johnson, and Thelonious Monk. "These are masters that I've always wanted to play with," Turre explains. While he has shared the stage with each of them over the years in various bands and all-star configurations, he says, "I've never had them play my music to hear what their mastery would bring to it. I wanted to hear how their interpretations would open up new avenues of expression to me." The results shine through in the individual and collective playing throughout Colors for the Masters. Those avenues open up through the grooving, funky swing that the whole band brings to the album's opening tracks, "Taylor Made," which Turre wrote under the blues-drenched influence of two of his mentors, Ray Charles and Art Blakey. They're evident in the heart-wrenchingly emotive soloing of Barron on Turre's gorgeous, aching ballad "Quietude," or Ron Carter's stentorian, bass-register solo on Wayne Shorter's frenetic "United." The opportunity for expressiveness that Turre was searching for is seized through Cobb's whispering, delicate brushwork on Monk's "Reflections" as well as on the full-throttle swing and brisk, rapid-fire soloing he unleashes on J.J. Johnson's "Coffee Pot." You can hear it in Jackson's fluid, cascading lines on "JoCo Blue," a simmering blues that Turre wrote in tribute to the great John Coltrane. Though he knew this veteran group would bring their magic to any music that he set in front of them, a few of the pieces were specially written or chosen for the occasion. "Coffee Pot" was on the program of a J.J. Johnson tribute that Turre led at the Indianapolis Jazz Festival in 2014, which also included Jackson in the band. Most obviously, there's "Mellow D for R.C.," a bold mid-tempo tune penned with Carter's familiar gifts in mind. "What needs to be said about Ron?" Turre asks rhetorically. "He's a grand master. I was delighted and thrilled and at the same time humbled to play with him. He gives you such a foundation." Turre heaps similar praise upon his other bandmates. "Jimmy's beat is timeless," he says of Cobb, best known for his stint with Miles Davis that included the recording of the landmark Kind of Blue. He also marvels at "Kenny's touch, sensitivity and nuance, and the colors that he plays." While he modestly deflects praise onto his collaborators for the session, Turre himself has long been lauded as one of the modern champions of his instrument, whether accompanying Rahsaan Roland Kirk, Woody Shaw and Lester Bowie or playing between the laughs through his 30-plus year stint as part of the Saturday Night Live band. On this album he pays homage to one of his idols, J.J. Johnson ("to the trombone what Charlie Parker is to the saxophone") and shows off his own wide-ranging virtuosity and depth of feeling, wringing touching melodicism from "When Sunny Gets Blue," navigating intricate modal playing on the title track, or spinning off darting, barbed licks on "United" -- a song he recorded with Woody Shaw, but without the solo spot he typically had on live dates. Turre's plunger solo on "When Sunny Gets Blue" not only shows off one of the most beautiful colors in his vivid musical crayon box, it is in a way another nod to the continuum of the jazz tradition. While a member of the Thad Jones/Mel Lewis Orchestra, Turre found himself playing next to Quentin "Butter" Jackson, who had taken over the plunger chair in Duke Ellington's Orchestra from Tricky Sam Nanton. Turre also shows off his Harmon mute playing on the melody of "Corcovado" and the solo on "Mellow D for R..C;" his solo on the latter features the cup mute. Then there's the conch shells, the instrument that Turre calls "the most ancient of horns" and that he largely introduced to the jazz idiom. He shows off his ability to moan the blues on the seashells on Jobim's classic "Corcovado" to close the album -- even playing two shells at once, echoing the show-stopping antics of his earliest mentor, Rahsaan Roland Kirk. "I'm still trying to grow," Turre concludes. "I'm very particular about how I present my music. I have a certain feeling and a certain direction in mind, and everybody on this record is in the same frame of mind about what jazz is and what this music means to them."